Quantity: Select size from the options tab above. 4 oz, 16 oz, or 32 oz. 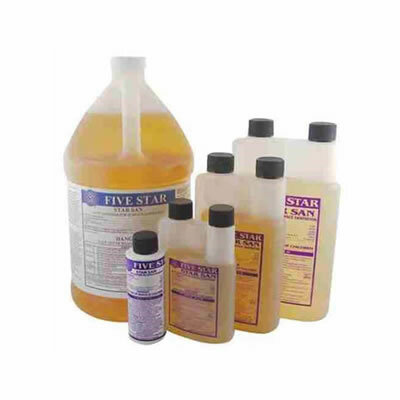 STAR SAN is a blend of phosphoric acid and dodecylbenzenesulfonic acid. This synergistic blend provides a unique killing system that is unaffected by excessive organic soils. STAR SAN is also a self-foaming sanitizer. It can be applied through a foamer to produce self-adhering sanitizing foam for external sanitation. STAR SAN is also an excellent sanitizer for hand application. Sanitizing with STAR SAN on a daily basis will leave equipment in an acid condition that will eliminate water spotting. It is not recommended to use STAR SAN on soft metals because of the acid nature of this product. 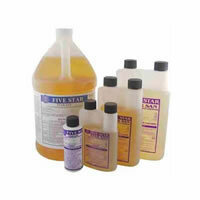 All surfaces should be cleaned and rinsed before sanitizing with STAR SAN. Directions: A dilution of 1 ounce to 5 gallons of water, STAR SAN will provide 300 ppm of dodecylbenzenesulfonic acid. After 1 to 2 minutes contact time, drain sanitizing solution equipment thoroughly. Do not rinse. If using Star San in CIP, proper water balance must be maintained or your pump may cavitate. If used at a rate of more than 300 ppm, a potable rinse is required. Part Soaking: Use 1 ounce of STAR SAN per 5 gallons of water. Parts must have contact with solution for 30 seconds and put on wet. When solution begins to cloud, sweeten with Star San or Phosphoric Acid. Solution must remain at a pH at 3 or below to maintain proper sanitizing level. Homebrew use: Thoroughly wash all surfaces with detergent or a compatible cleaner, followed by a potable water rinse before application of sanitizing solution. Prepare a use solution of 1 oz. of Star San per 5 gallons of tap water. Apply on surfaces with a cloth mop, sponge, spray or by a 5 minute immersion. For spray applications, use a course mist, with pump or trigger spray. Spray 6 to 8 inches from surface; rub with a brush, cloth or sponge. With spray, cover or remove all food products. For all applications, allow to air dry, however surfaces must remain wet for at least one minute. Do not rinse after Star San application.